Organizations of all shapes and sizes are looking to private cloud implementations to increase IT efficiency and help end users collaborate more easily. But they're finding out that the advantages can only be achieved when they ensure their wide area networks (WANs) can offer speedy access to centralized IT resources for faraway users. 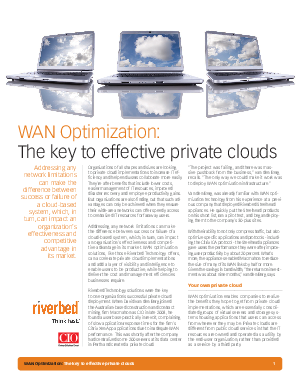 This CIO article discusses how WAN optimization solutions, like those Riverbed Technology offers, can accelerate private cloud implementations and enable users to be productive, while helping to deliver the cost and management efficiencies businesses require. Learn why companies like MasterBrand Cabinets chose Steelhead WAN optimization appliances for superior performance.